AD players Presents: You can't take it with you - Printer Friendly Page - On the Run - Theatre Port Houston - Theatre Auditions News and more! 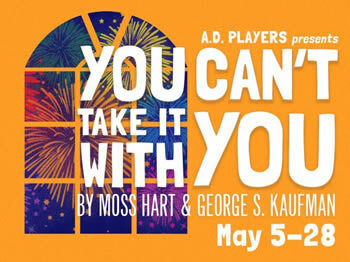 A.D. Players presents You Can’t Take It With You by Moss Hart and George S. Kaufman. The play will run from May 5 – 28 at the George Theater. Alice Sycamore comes from a family of lovable eccentrics, while her fiancé, Tony Kirby, comes from a long line of impeccably well-mannered but unhappy aristocrats. When Alice invites her perspective in-laws for dinner, she hopes for the best. Instead, her family behaves at its hilarious worst. The ensuing mayhem makes for the best kind of comedy–one that teaches us a few lessons in tolerance amid the laughter. Directed by Thomas Prior, and featuring local favorites Philip Lehl, Susan Koozin, and James Belcher, along with members of the A.D. Players acting company.